COIL BRITE | Pro Chem, Inc. 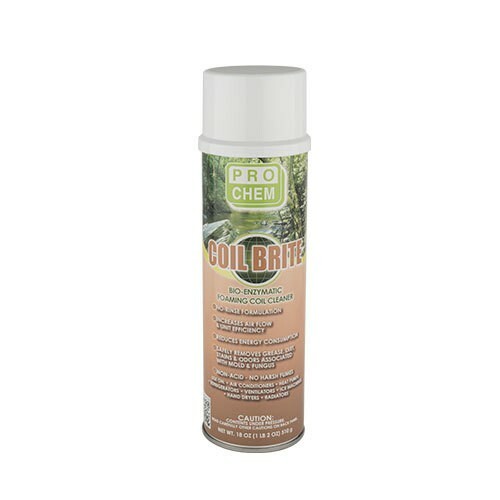 COIL BRITE is a powerful, nonacid, foaming coil cleaner that is formulated for continuous cleaning. Its bioenzymatic action facilitates the breakdown of organic odors and blockages. 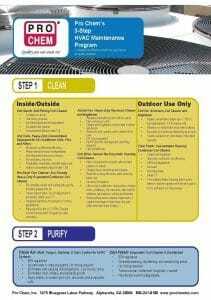 The powerful spray generates a thick, water-based foam that blasts deep into the coils to loosen and remove grease, dirt, lint, grime and other efficiency-robbing elements from evaporator coils. Before using, turn off power. Protect all electrical equipment and parts with plastic or aluminum wrap. Spray coil area thoroughly with penetrating and holding foam. Foam breakdown and dirt absorption indicates when surface may be clean, if desired. Rinsing is not required. For stubborn build-up, a repeat application may be necessary. Can also be sprayed directly into drip pans or drain lines. Note: Initial cleaning of heavily soiled areas may require the use of more aggressive products prior to implementing the regular use of these safer alternatives.